One afternoon, my husband came home from his weekly movie run. The kids were thrilled! Nothing beats weekends with a fresh flick and a fresh tub of buttered popcorn. So can you imagine their dismay when they found out the movie Dada bought was... 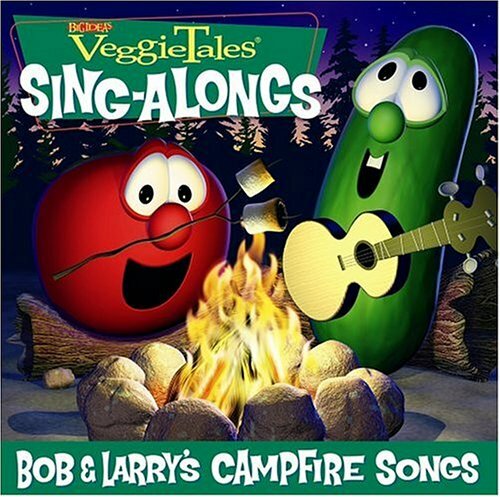 VeggieTales??? 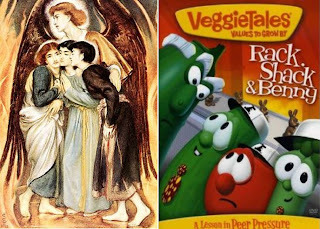 What the dickens was VeggieTales?! It's not made by Pixar, not by Dreamworks --so it might as well be junk. Well, my boys are eating their words now. VeggieTales, a series of movies featuring cutely drawn vegetables talking about good values and God, actually caught our boys' fancy on the get-go. I thought it would be like one of those boring biblical cartoons. But VeggieTales had the edge and the wit. It retold the bible stories in a new, engaging manner each time. From Meshach, Shadrach, Abednego and the Golden Calf, VeggieTales offered Rack, Shack, Benny and the Chocolate Bunny. 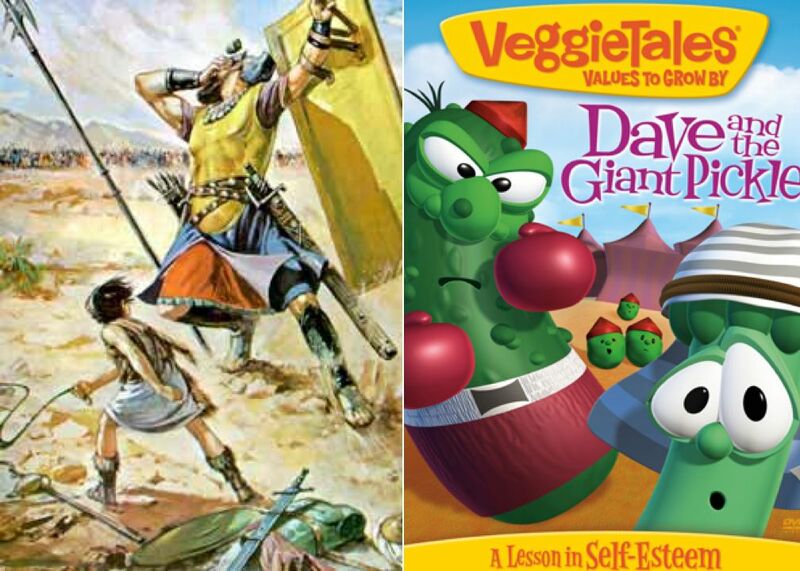 From the classic David and Goliath, VeggieTales brought forth the spunky Dave and the Giant Pickle. 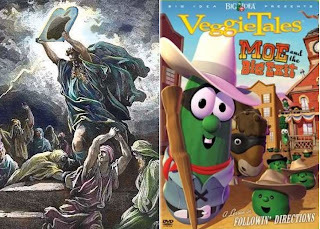 From the daunting Moses and the 10 Plagues, VeggieTales gave the hilarious Moe and the Big Exit. It's the same basic story flow. But the difference is in the funnier role players, the wackier scenarios, and the side-splitting script. Purists would go and bash these deviations from the originals. Some would say it's a violation of the sacred word. But, seriously, as long as kids learn the very same moral lessons from both stories, then it would cause more good than bad. 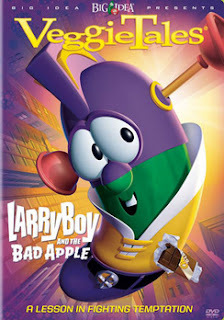 Values are further pushed through another VeggieTales sequence called Larry Boy --a clumsy yet valiant superhero cucumber out to save kids from telling lies and spreading rumors and disrespecting their parents. Miro and Kenji absolutely love this gourd! And to cap the sweet deal, the movie series brim with great songs as sung by the zany duo, Larry the Cucumber and Bob the Tomato. You guessed it --the songs still instill all that is good no matter how silly they're sung. 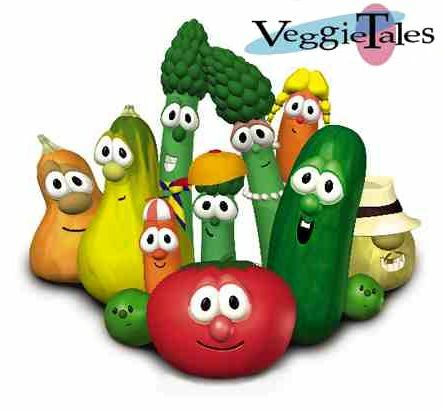 I'm giving VeggieTales a thumbs up for being such a win-win movie choice for many weekends now. And two thumbs up with the sweetest hug to my husband for bringing it home.